Brass Lock Nuts, Washers & Switch Parts are obtainable in various sizes, shapes, and designs, which can be customized as per the specific requirements of our clients. 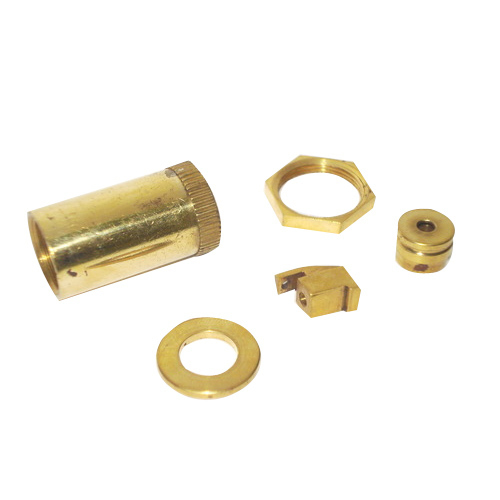 Lock nuts should be used with cable gland to secure it to a gland plate, our range brass washers electrical switch parts display high conductivity. These are provided features of high durability, reliability and long service life. An NS-EN ISO 9001:2008/ISO 9001:2008 certified organization engaged in manufacturing, supplying and exporting a huge gamut of Brass & Copper Components to our customers. Our range consists of Brass Machine Screws, Machine Screws, Brass Screws,Precision Brass Components, Brass Fixtures, Brass Electrical Neutral Bars, Brass Switchgear Components, Brass Fuse Connector, Brass Pneumatic Fittings, Brass Extruded Components, Industrial Fasteners etc. Our range is manufactured using superior quality materials that are sourced from the reliable vendors in the market. We are supported by a state of art manufacturing unit that is managed by a team of experts to offer an unmatched range to our clients. We also have a team of quality analysts who are highly qualified and experienced. They check the quality of these products on various parameters to ensure their utility in various sectors.